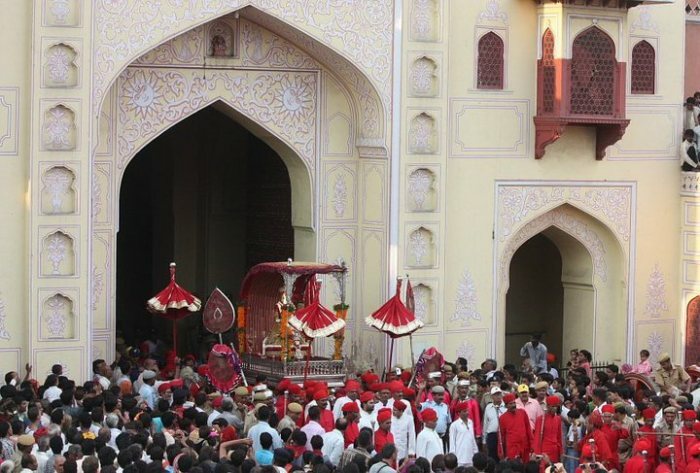 Teej is one of the most widely celebrated festivals of Rajasthan. Swings, traditional songs and dancing are the unique features of Teej celebrations in Rajasthan. Women perform traditional folk dance dressed in green coloured clothes and sing beautiful Teej songs while enjoying their sway on swings bedecked with flowers. On the occasion of Teej, markets in Jaipur are stocked with trendiest women accessories and clothes. Most of the fabric clothes display ‘laheria’ (tie and dye) prints. Sweetshops keep different Teej sweets but ‘Ghevar and Feeni’ is the main sweet of the season. All over Rajasthan, swings are hung from trees and decorated with fragrant flowers. Women both married and unmarried love to swing on these swings to celebrate the ‘Sawan festival’. 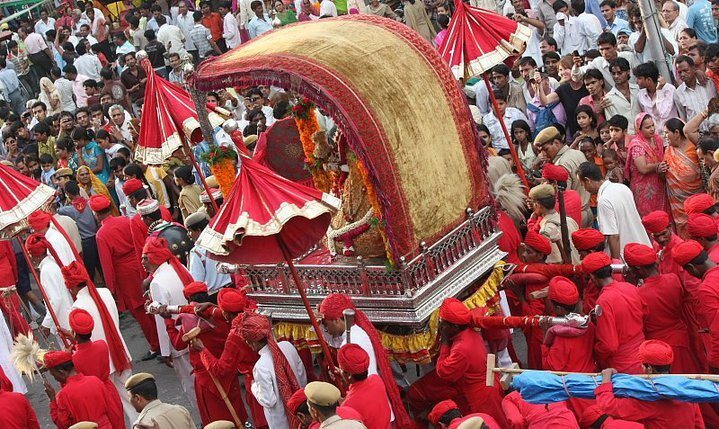 As always, sitting arrangements for tourist will be done on the terrace of Hind Hotel, opposite Tripoliya Gate on 9 and 10 August during the traditional Teej Procession in Jaipur. The traditional Teej procession with all its regal pomp and pageantry, will start on 9 August at 6 pm from the Tripoliya Gate (City Palace), winding its way through Tripolia Bazar and Chhoti Chaupar, Gangauri Bazaar to wind up at the Chaugan Stadium. The procession will also leave next day at the same time. 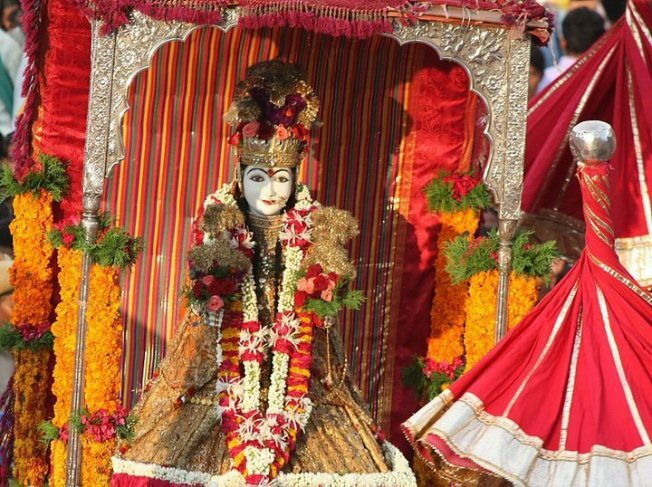 In the procession of Goddess Teej, right in the front will be folk performances like kacchi ghodi, Kalbeliya, Algoza, Bahrupia, Gair, Bail Dance and Chakri dance, among others. 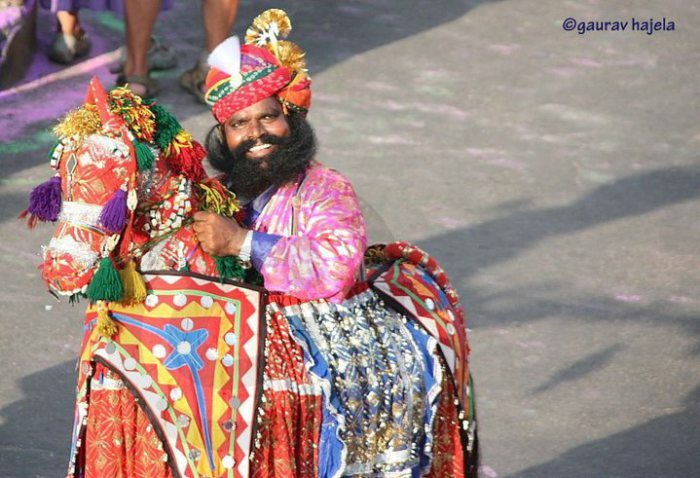 In the procession the tourists and the visitors will also be able to witness a large number of bands, ornamented camels, mounted police on horses, women in traditional dress with Kalash and Dhalet Chobadars. Next Post Where to Flock on for Nightlife in Jaipur ?